Javier Bardem in Oscar-nominated performance in "Biutiful"
The harshness of winter continues to exert all kinds of practical adversity to those in the Northeast, but others in the midwest and the south have fared little better in this most infamously memorable of seasons. While framing the events of a blog which are experienced and enacted in a largely ‘indoor’ venue with outdoor conditions might be a bit inconsequential, it does affect those who are busy making their way to theatres and concert halls, much less to their daily jobs. In any event, another old-fashioned blizzard is tentatively scheduled for mid-week in the NYC area, so the old warnings are still in place. With the PGA, DGA and SAG well in hand it’s clear now that the British period piece The King’s Speech is well on it’s way to big-time Oscar glory. As I consider it one of the year’s best films, I am smiling at this development, especially since it appeared for two months that The Social Network had this all wrapped up. When Hideaki Anno began his Rebuild of Evangelion series, retelling the story of his infamously popular anime Neon Genesis Evangelion, it would’ve appeared at first to be nothing more than just another stab at “Special Edition” filmmaking, the kind of approach that George Lucas took when he revisited his original Star Wars trilogy back in 1997 with updated CGI special-effects and a few revisionist edits– irrelevant and harmless changes for most viewers, but anathema to anyone who guards the films themselves as closely as an Otaku’s collection of toys and souvenirs. 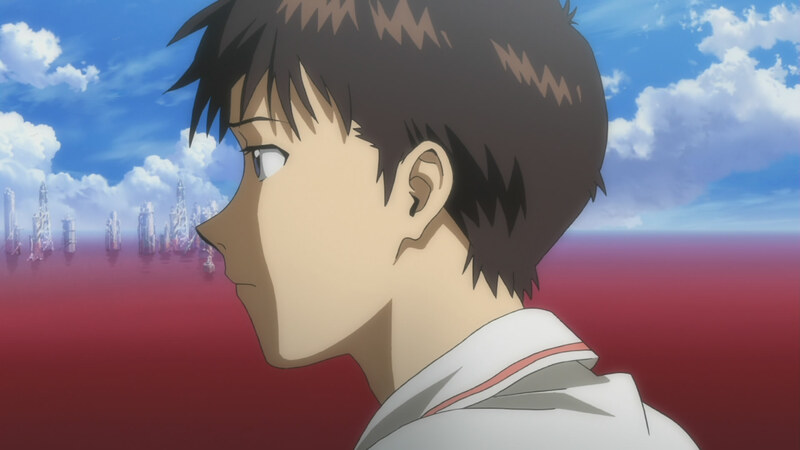 Fans of Evangelion might’ve had reason to react just as jealously to the news of Anno’s decision to go back to the series that had won him droves of support and just as many droves of criticism as well, usually from the very same people– like Lucas before him, Anno tends to bring out the more bipolar tendencies in modern fandom. To a large extent, that passive-aggressive appreciation has been somewhat mutual on the director’s part, as evidenced by the End of Evangelion film, which saw fit to wrap the original program’s already confusing storyline with even more confusing hallucinatory and apocalyptic imagery, culminating in a series of disturbing sequences that seemed tailor designed to upset the massive fanbase built up over the years, symbolically and literally crucifying the characters they’d come to know and love and stranding them into their own private wastelands of existential and global collapse. Therefore, when 2007’s Evangelion 1.0: You Are (Not) Alone was released and mostly stuck close to the original series’ first six episodes in everything from the story to shot-for-shot recreations, albeit at a much grander scale for theatrical production, it seemed as though all we’d be getting from the Rebuild series in general would be a mere retread of all the old familiar places, with perhaps a somewhat more unified vision by pulling together all the disparate strands of the franchise’s animated incarnations, however welcome that might’ve been. If fans really do feel married to the franchises they follow, it looked like all they’d be getting would be something borrowed, instead of something new. Well, not quite, as it turns out. If 1.0 was a mere “Special Edition” of the first arc of the show, then Evangelion 2.0: You Can (Not) Advance is closer in spirit to the wildly revisionist, yet authentic take of a franchise’s spirit of the Star Wars prequel trilogy, recasting all the same archetypes and mis-en-scene into a wonderfully bright and new visual and narrative palate, recycling just enough of what was in play from before in order to better confound, surprise and delight audiences who think they know what they’re in for. 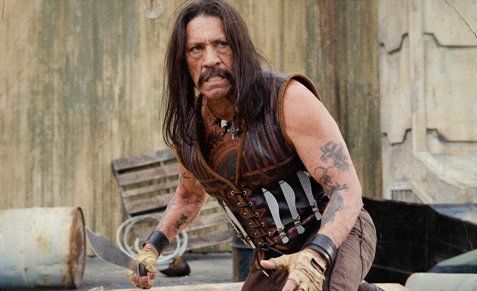 "Machete" is in the 20th spot in my list. So, here I am, after all my talk about doing my list in february I’m doing it now. Why? Well, I was checking my blog archives and it turns out I always posted my list a couple of days after the Oscar nominations, an ocassion that always bring me some sort of happiness: I get to see a lot of films and everyone is doing their predictions, even if the nominees aren’t what you expect, you always root for something at the end of the day. Looking back, awards season has always meant something for me, and the Oscars have a special place in my heart, since usually I started going to school the next day, now university, and you always have something to talk about for a couple of days (and it’s an excellent conversation fuel with people you don’t know yet). Now this should be the paragraph in which I talk about how a bad year for movies 2010 was, and how future looks dim and somber and how we are all going to die a sad death. I won’t do this to you, but I’ll say this, 2009 was a better year for movies, the range between good and bad films was very small and I have to say that any of my four favorite performances of last year (Nicolas Cage, Catalina Saavedra, Christoph Waltz and Maggie Gyllenhaal) are way better than the four performances that (for now) are my favorites of 2010. There has been a real disminishment in quality overall and I can’t explain why, there was no real technical dazzlement apart from the movies that make the first five spots in my list. So, I bother you no more with my random thoughts and I present to you the better 20 films of those I’ve seen in 2010. Keep in mind that this list includes shorts, TV movies and miniseries as well, and they must’ve been released in the year 2010 period, no 2009 or 2008 movies that were unseen until now, no exceptions made whatsoever. Let’s start then. There’s an interior-decorating philosophy that espouses the idea of using mirrors to make a small room look bigger. I don’t know if it’s related to fung shui, or perhaps just a very basic recognition of the power of duplicated imagery, but there’s something about it that can work rather well, and at times even do wonders. With one mirror, the horizon of a single room can extend just a little farther, and open things up just enough to stave off unconscious feelings of claustrophobia in the mind’s eye, if not in the actual ones for very long. Place another one in the room with it at an angle, and things open up even more, allowing you to curve space subtly with reflected reflections, building a new and artificial kind of architecture through the location’s subliminal atmosphere. Finally, put a pair of mirrors directly across from one another and you have that classic barber-shop parlour trick of infinitely extending reflections receding into both directions, that little feat of magic that Orson Welles put to such good use near the end of Citizen Kane and Carl Sagan used to similarly impressive import in one of the later episodes of Cosmos, expressing the inherently evasive concept of eternity itself. Plenty of filmmakers and artists have exploited this potential for mirrors as instruments of mind-bending challenges of time, space and pure mathematics– some ten years ago I can remember a recreation of a Yayoi Kusama installation, full of polka-dotted rock formations extended in all directions by an entirely mirrored room, while strolling through a retrospective of her work at the Museum of Modern Art. Recently I had another encounter with the mirrored-lens visions of uber-reflective expression at MoMA while catching a rare screening of a newly remastered World on a Wire by Rainer Werner Fassbinder, a work which has long gone unseen since its original broadcast as a two-part miniseries for German television in 1973, and expands the famously bold director’s body of work to include science-fiction alongside all the old familiar places of Douglas Sirk melodrama and World War II era expressionist musicals. 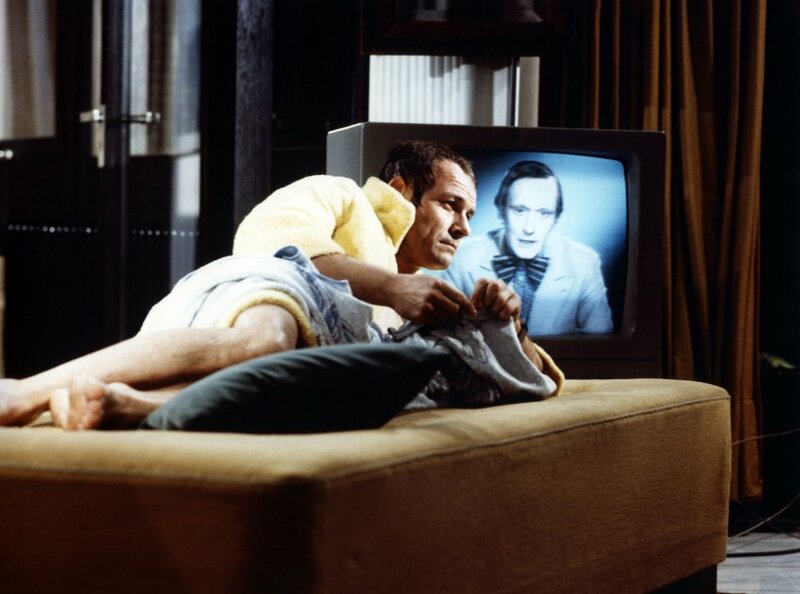 But not only does this film show Fassbinder’s take on sci-fi– it also manages to tell one of the first cinematic depictions of virtual-reality, long before the likes of Tron, The Matrix or Inception, and with a surprisingly dexterous hand, especially when it comes to presenting various layers of simulations.